Beautiful thick 16mm / .63in 100% cotton pile. Reversible cotton rug design is exceptionally unique. Very soft and plush. Designed and produced by well-known German brand Kleine Wolke, established in 1968, and is backed by their quality guarantee. 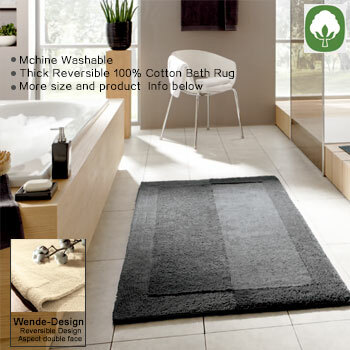 This cotton bath rug desgin is available in hard to find extra large sizes. Snow White Beautiful snow white reversible cotton bath rug. Silver Grey Very light silver grey. Slate Grey Beautiful deep grey plush reversible cotton rug. Natural Very light cream color. There is a hint of yellow in this light cotton rug. Havanna elongated lid covers are a solid color and coordinate with each rug swatch. They are 100% cotton. If your elongated lid is at least 17 inches long and no more than 18.5 inches long our elongated lid covers will work for you. They have a drawstring design allowing the lid cover to conform to your toilet lid. Havanna elongated lid covers are a solid color and coordinate with each rug swatch. The lid covers are 100% cotton. If your elongated lid is at least 17 inches long our elongated lid covers will work nicely. They have a drawstring design allowing the lid cover to conform to your toilet lid.